Experian Health is pleased to announce that we went live with Patient Estimates at St. Clair Hospital located in Pittsburgh, PA on February 22, 2016. A true representation of vendor and hospital collaboration and commitment, the Patient Estimates cost transparency tool gives St. Clair a competitive edge as the first hospital in its region to offer patients cost estimates in advance. Patient Estimates is not a list of charges, but an interactive and user-friendly tool that provides information that is highly specific to the individual. Estimates are designed to determine, in advance, each patient’s out-of-pocket costs (deductibles, co-pays and co-insurance) for services at St. Clair based upon his/her insurance coverage. The estimates also incorporate St. Clair’s discounts for payment on the date of service and for those without insurance. The estimates remain in the system and can be recalled for future reference. Patient Estimates is simple to use and is conveniently available 24/7 at www.stclair.org. On the home page, patients will select the “Financial Tools” option, then click on Patient Estimates. They will then enter their health insurance information before choosing one of the 100 listed clinical services (e.g., a procedure, treatment or diagnostic test) from the drop-down menu. The tool then provides a customized estimate of their out-of-pocket expenses. 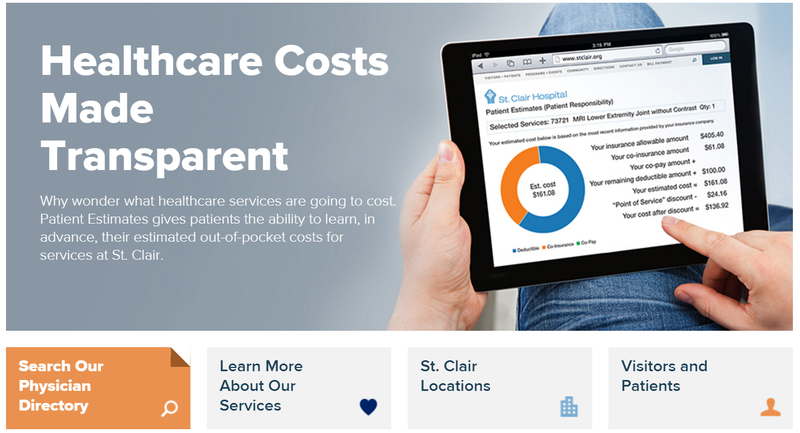 Patient Estimates is designed to help insured and uninsured patients get clear, real-time, easy-to-understand cost estimates for St. Clair’s services so patients can make informed decisions about their care.